The Amazing Spider-Man Annual #1 review – AiPT! While Peter sleeps, the symbiote creeps! Take a look back at the post-Secret Wars days of Peter Parker and his clingy new suit. The Amazing Spider-Man Annual #1 tells “an untold tale in the history of” Spider-Man during the time after the first Secret Wars where Peter Parker left Battleworld with a new suit made assumedly of alien technology. Readers today know this suit to actually be the symbiote who would later join Eddie Brock to form the iconic character, Venom. In this annual we get a closer look at the nights the symbiote took Peter out on the town while he slept to fight crimes without his knowledge. Is this tale one worth knowing about or should it have been left untold? Writer Saladin Ahmed nails the sound of Peter Parker and Spider-Man in the 80s. The dialogue is just over-dramatic and exposition-heavy enough to sound a little dated, but it never veers so far in that direction that it can’t be enjoyed by a modern audience. 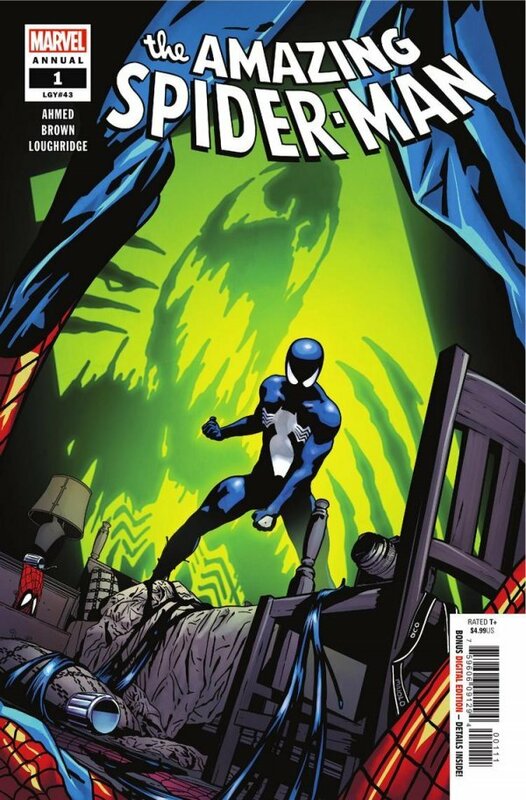 In this annual, Ahmed is at his best when writing the narration told from the perspective of the symbiote, referring to Peter as “the friend” and to his body as “meat.” Just as he also strikes a balance between old and new in the dialogue, he expertly measures the weirdness injecting into the narration, making the symbiote sound as alien as it is without it sounding so otherworldly as to not be able to narrate the story. The action of the plot is kept fairly simple and straightforward so as not to mess with any continuity, but with such distinct voices, the Spidey character we know, along with other characters like a street-wise young man the symbiote saves, add a sense of perspective and grounded feeling that carry the book forward. Garry Brown’s pencils and inks in this issue are loaded with personality. From the panels filling the reader in on the events of Secret Wars, to highly detailed and towering cityscapes, to all the hand-drawn sound effects, this is a book with a distinct style that makes the story come alive in a really exciting way. There are a ton of creative choices here that made me smile, like framing half a panel in black with characters’ heads cutting into the darkness with the colored background just around the outline of their heads. Brown also chooses to add thick, choppy lines to characters’ faces for eyelashes in some panels, and in a full-page spread featuring Spidey web-swinging around, renders all the massive buildings upside down to give the page a more dynamic perspective. It’s decisions like these which show that, like Ahmed, Brown is approaching the book with a unique perspective outside of a typical house style. Lee Loughridge’s palette for coloring the book includes a lot of purples and blues, which are natural choices for a story prominently set at night, but the bright hues of purple Loughridge chooses also suggest an otherworldly quality appropriate for a symbiote-centric story. For lighting, he often employs splatters of bright color that fit the palette of the page, but can’t be attributed to a particular light source, just like how a city glows at night from all directions. Whomever had the idea of adding the filter of faint Ben-Day dots to the pages deserves applause, as it adds an extra layer of texture to the issue that gives it a nice old-school feeling while filling the space in otherwise blank areas of the panels. Though the sound effects in this issue are hand-drawn, Joe Caramagna’s lettering does a lot of work guiding the reader’s eye along the page, especially when it comes to the placement of word balloons and the way their tails stretch out to whomever is talking at any given moment. Overall, The Amazing Spider-Man Annual #1 is an untold tale worth experiencing. Each member of the creative team brings a unique flavor to the creation of this book and make an otherwise simple story burst with personality. Any Spidey or Venom fan is going to want to pick this annual up, as it further enriches the history of the symbiote in a way that conveys a lot of care from creators. From the stunning artwork to the grounded, genuine sounding voices, this annual tells an untold tale worth hearing in style. Saladin Ahmed expertly portrays and the sound and style of 80s Spider-Man while keeping the dialogue fresh enough for a modern audience. The symbiote in particular acts as an excellent narrator and sounds just alien enough to add to the distinct sound of the book. Garry Brown’s pencils and inks are loaded with personality whether it's in stunning cityscapes or hand-drawn sound effects. Lee Loughridge’s color choices evoke the otherworldliness of the symbiote and light up the issue in creative ways that feel appropriate to the nighttime city setting. Joe Caramagna’s letting guides the eye around nicely with well placed word balloons whose tails show you exactly where to go. If you know the symbiote's story, the plot won't surprise you, but the characters’ voices are so distinct they carry the issue forward.